Singer/Songwriter/multi-instrumentalist 'Ross Royce' debuted on the Australian and New Zealand scene in 2006 with his E.P "Get it Together".He played drums,guitar,keyboards and did most of the vocals on a number of the song's as well as co-production! Musician friends Trevor and Keijo helped on a number of tracks. Ross Royce is currently based in Melbourne,Australia where his newly released debut album "Life Worth Living" was recorded. -Went to No.2 garage,No.5 Indie and No.7 Rock on the Australian myspace 'Top Artists'chart. -Top 10 on a number of internet radio charts inc:"Rockin the Shed" and "Just Say Rock"..
-Artist of the week on MP3.com.au(Dec2006),Garage band.com(Sept 2007) and on LPM(March 200 . -Worldwide digital distribution and nationwide physical distribution across Australia as well as distribution with 'Amazon' in the the U.S.
"Mrs.Vain","Mixed up World","Thats not me"-Internet and radio airplay.Distributed nationally around Australia. 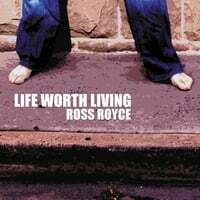 A Rock/Pop extravaganza about the World we live in by New Zealand rock artist "Ross Royce"
"Life Worth Living" Reviewed by RadioIndy.com! Ross Royce puts it perfectly in his short, spoken word opening to "Mrs. Vain," the second track off his album "Life Worth Living" - "this is rock & roll." Royce, who creates most of the sounds that you hear on the album, spans the genre instrumentally and vocally. He seems to transform musically from track to track, ranging from the masterfully crafted piano rock sound of Ben Folds to an acoustic Bowie to a bluesy number reminiscent of Stevie Ray Vaughn, and finally to Floyd-esque space rock. The recording is clean, and allows each track to live up to its full potential. Ross’s vocals work well in these rock and roll tracks. The highlight of the album, in our view, is the three track block of "Suzanne," "Hello People Pt. 2," and "Suzanne's Meditation." The tracks flow, each a response to the next, and give a crisp space/arena/art rock feel, thereby showcasing Ross’s excellent songwriting and instrumental talent. For people who enjoy listening to albums from beginning to end and vocal stylings that remind you at once of the eighties and indie artists like Art Brut and Bloc Party, check out what this creative CD.